Are you discouraged whenever you come across a little opposition and resistance? Do you fail to achieve your dreams because you always expect and want it to be easy to do so? Whatever you want to achieve in life, it is very likely that you will run into some resistance. This resistance may come in various forms and at times from unexpected or unusual places. It is a natural thing in nature that for every action there is an opposing and equal reaction. If you want to move, you must overcome friction and gravity. This may not seem to be a good state of affairs, until you realise that it is actually the opposition of gravity and friction that strengthens you. In order for you to walk and jump, your muscles have to develop the strength to overcome gravity and friction. The experience of astronauts shows that when they go to outer space where there is less gravity and friction, their muscles and bones actually become weaker, to an extent where some fail to walk for some time on their return to earth. Without the opposition of gravity and friction their bones and muscles deteriorate. Just a few days ago, I came across some resistance myself. I got an anonymous message posted from the comment page on my website. Usually these messages are from people that have found my articles and website interesting and helpful and they encourage me greatly to keep writing and telling people that they can achieve their dreams. However, this message was different. The unknown person accused me of stealing their work word for word in my articles. I was shocked, to say the least. More surprising was the fact that he went on to threaten to “notify the Post and even take a large ad in the Times and Daily to expose” me. I read the message again just to be sure I was reading it correctly. I was. What I felt at the time was a little disappointment and then amusement. This soon turned to utter disbelief when a few minutes later the anonymous writer sent an email declaring his identity and formally accusing me that “most of the articles that you have written for the Post contain my original work and writing.” It was from someone I truly respect and admire, and someone I aspired to work very closely with in future in order to make a positive difference to the lives of many people in this country. However, my disappointment, disbelief and amusement soon turned into a burning resolve not only to continue doing what I am doing, but to do it even better. In addition to that I was inspired to do a lot more than I am currently. That resistance and opposition is perhaps the very thing I needed to strengthen myself and develop myself further. 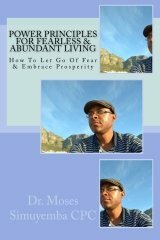 I refuse to wallow in fear and let anything like that hinder me. This will not be the stone that will crush me, but the stepping stone to greater things! So, if you are not being challenged in any way, you cannot grow. If you do not have anything to push against, you cannot make any progress. This is a revealing but true concept. If you are absolutely satisfied with your life the truth remains that you will not try to change it in any way. Any positive change must come as a result of some negative influence that forces you to change. This negative influence can take many forms - from dissatisfaction with your work to disappointment from your girlfriend or boyfriend. There are many geniuses out there who found their passion and did amazing things after some tragic event in their lives or after being disappointed in one way or another. As a dreamer, you must always be prepared for opposition. In particular, you must be prepared for the nay-sayers and the haters. These are the people that would love to see you fail and they know that you will fail in trying to live the life that you deserve. At times it may be people you truly trust to help you along on your journey. Instead they try to stop you and discourage you. Spouses, relatives and close friends are some examples. My anonymous e-mailer is another. This is a facet of human nature that is hard to understand. Why would anyone want to stop someone else from being all that they can be? The answer is simple. That would expose their own failures and shortcomings. It is not that they don’t believe in you – they just don’t have enough belief in themselves. They would judge you based on their own abilities. But rather than get discouraged and defeated you can use their unbelief to spur you on. I have found that there is nothing that can encourage you to take action more than having someone show doubt in what you can do. As Lee Iacocca said: “In times of great stress or adversity it's always best to keep busy, to plow your anger and your energy into something positive.” What Jim Rohn did is a good example of that principle at work. I would urge you right now to write a list of things people in the past have said you can’t do. I would urge you also to plan your victory celebration – what are you going to do once you get there? What are you going to do to help elevate those who will be in the position you may be in now? The Bible says in Genesis as Joseph addressed his brothers: “But as for you, ye thought evil against me; but God meant it unto good…” Turn the negativity into a positive. Overcome the opposition and prove them wrong. You are all you can be. Go on and be it. "Overcoming Negativity" is published with the permission of Post Newspapers Limited. All original images ©Moses Chikoti Photography. If you would like to know how you can build your own website like this one visit the link below. 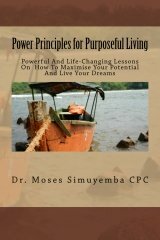 "Powerful And Life-Changing Lessons On How To Maximise Your Potential And Live Your Dreams"
"How To Let Go of Fear and Embrace Prosperity"
In the POWER PRINCIPLES series of books, Dr. Moses Simuyemba, "Africa's Success Coach", shares his knowledge, experience and insight to help you in overcoming your personal challenges and limitations and inspire you towards the life you desire and deserve: a life of greater purpose, free of fear and full of abundance.